I spotted this collection of mobile phones in the window of the Transport for London Lost Property Office in Baker Street. 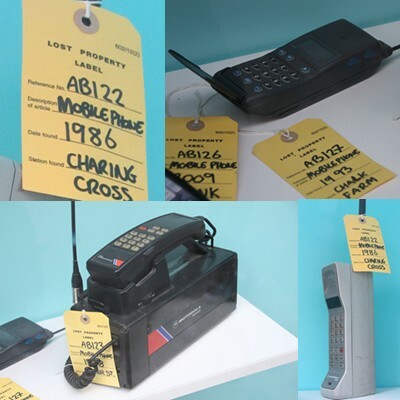 They were lost at the time those phones were current and confirm the heavy use of mobile phones in the capital in the 80s, as well as the beginning of the fledgling consumer mobile business in the early 90s, which initially served London only. Bottom right are two Motorola classics from the 80s. On the far right is a Motorola 8000S, mislaid at Charing Cross in 1986. In those days time was worth more than money to mobile phone users, so perhaps he or she did not think it was good use of time to reclaim the phone. The Motorola 4500X, bottom left, was left on the Tube in 1988. Perhaps the owner was just tired of lugging it around? The 4500X was a transportable, rather than a hand portable. It was bigger, heavier and cheaper than the 8000S. Rather than a high flying city executive, its owner would have more likely been a builder. Top left is a Mercury M301, lost in 1993 at Chalk Farm. This probably belonged to one of the mobile phone consumers. Mercury started their One2One service in the London area in 1993 and this is one of the first handsets.